Last week, J and I drove to Memory Express in Northeast Calgary to pick up a monitor for one of his co-workers. 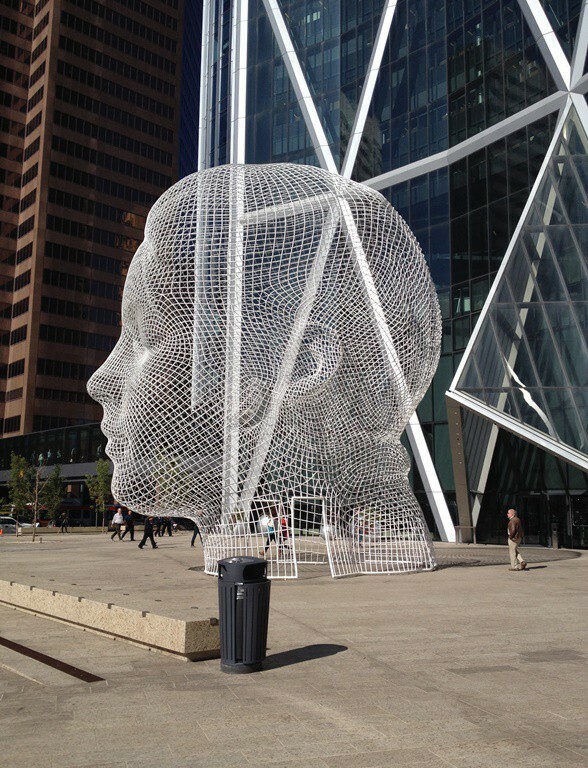 We drove through downtown and caught a glimpse of a giant, wire-mesh head. Wow! 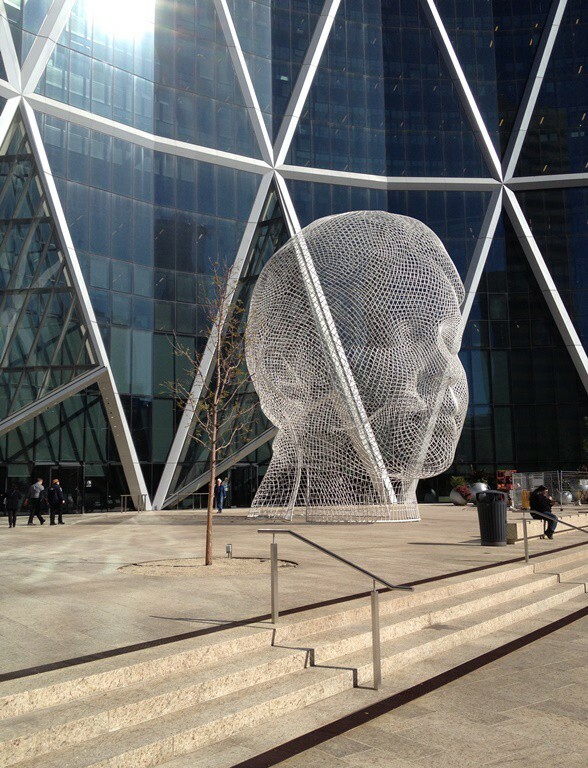 So I googled “giant head sculpture calgary” when I got home and there it was: a 12 metre high girl’s head entitled Wonderland by Spanish artist Jaume Plensa. 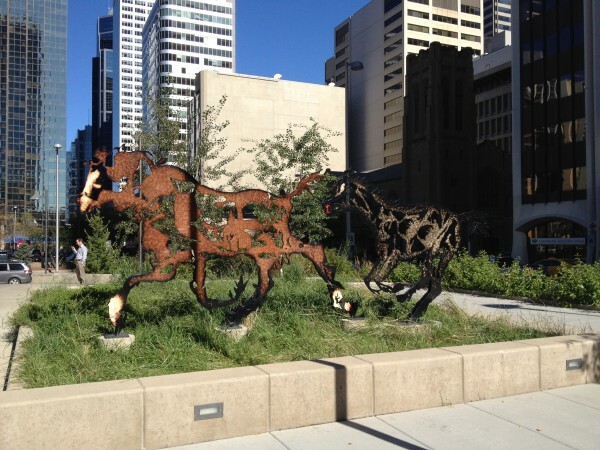 The sculpture was completed in 2013 and is at the base of The Bow, the tallest skyscraper in Calgary and Western Canada. 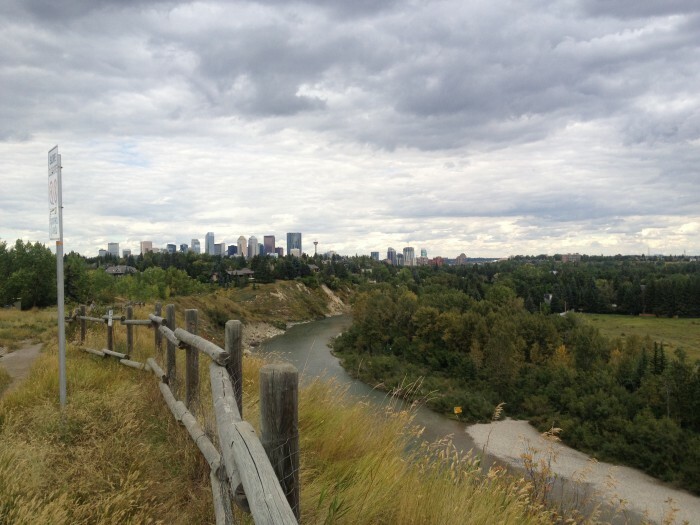 Today, my building shut off the water between 11 am and 2 pm, so I thought I’d walk up to Sunnyside (a neighborhood just north of downtown Calgary) for lunch. 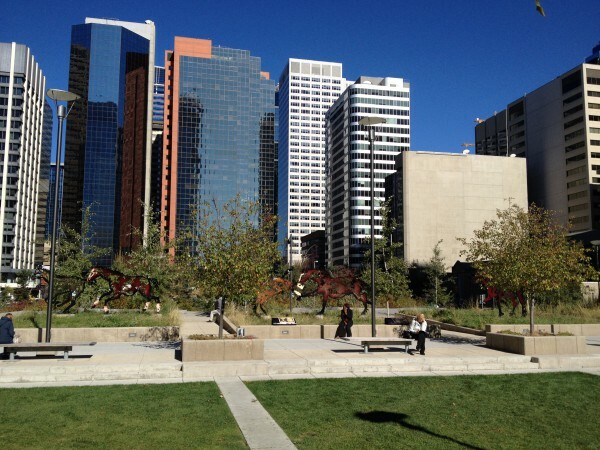 I meandered through downtown and then through Prince’s Island Park on my way there. To me, Wonderland seems ethereal. I get the impression that there is a girl in another world who is dreaming this city, and her “ghost head” is the observer in the dream. 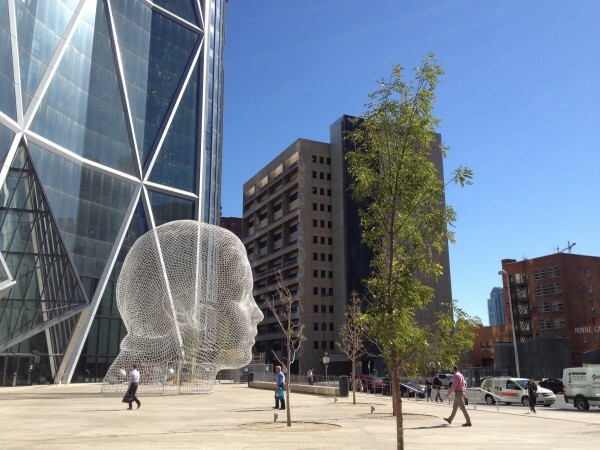 The Bow is on the corner of Centre Street and 6th Avenue. 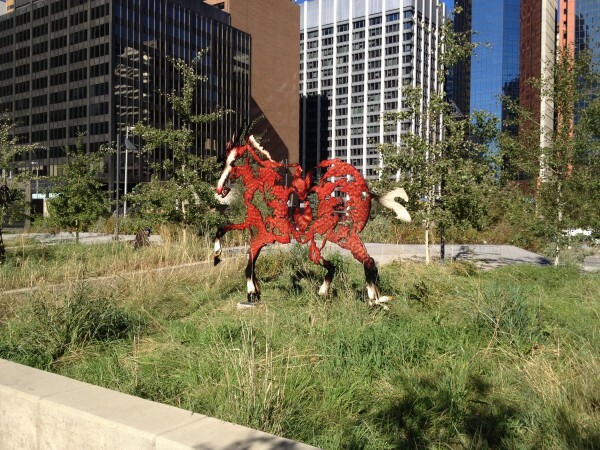 I walked east on 6th Avenue for a few blocks. You can see a peak of The Bow at the end of the block. Perspective can be tricky! 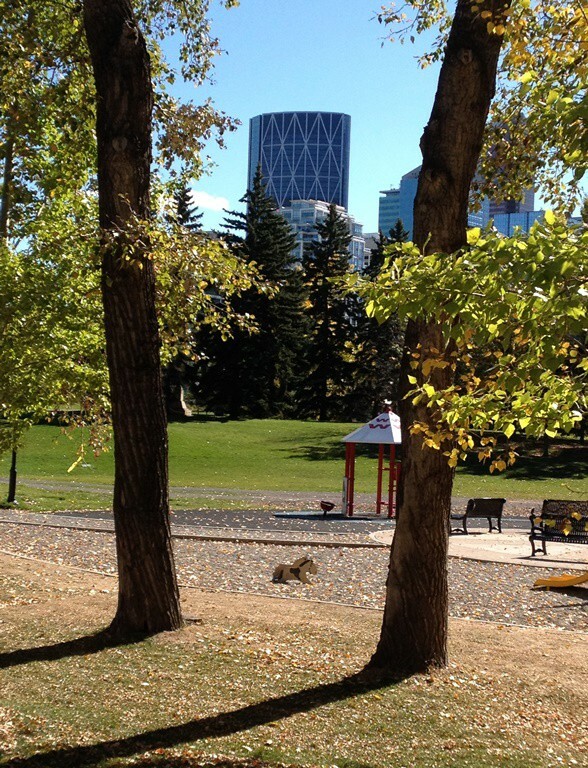 Here is view of The Bow from Prince’s Island Park. 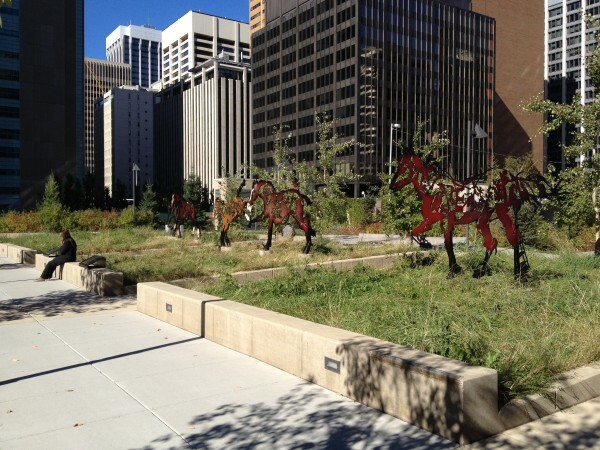 Before reaching the big head, I saw another lovely sculptural piece by Joe Fafard: eight wild horses in the Courthouse Park (7th Avenue and 4th Street). 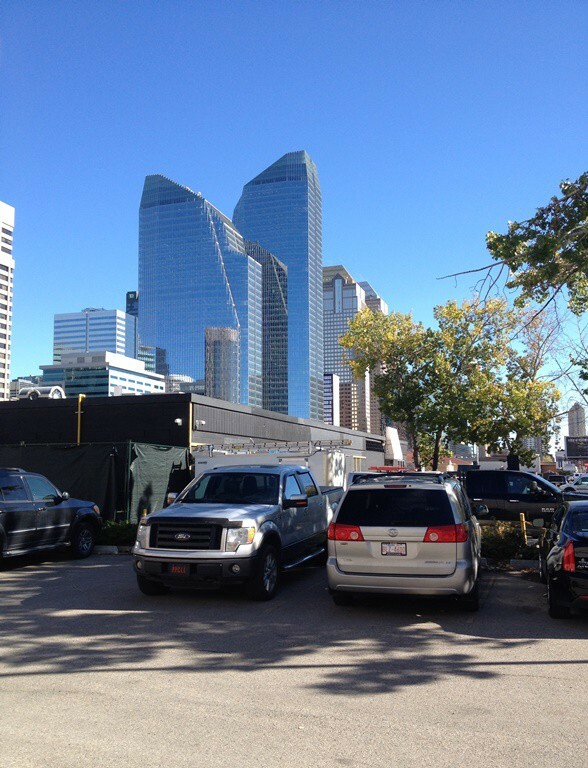 I also walked by the two Eight Avenue Place towers, my favourite glass and steel giants in the downtown Calgary skyline. 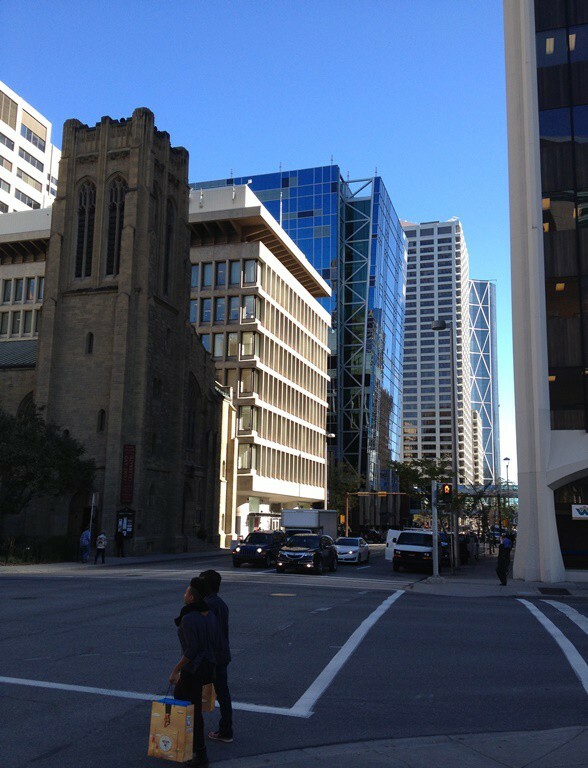 I like the colour of the glass and the sloped and asymmetrical upper storeys. 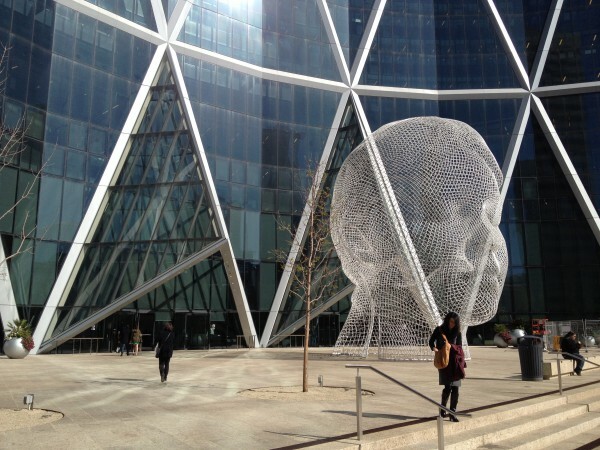 According to the project architect James Fullton, the shape of the upper storeys is meant to reference the peaked and faceted Rocky Mountains. 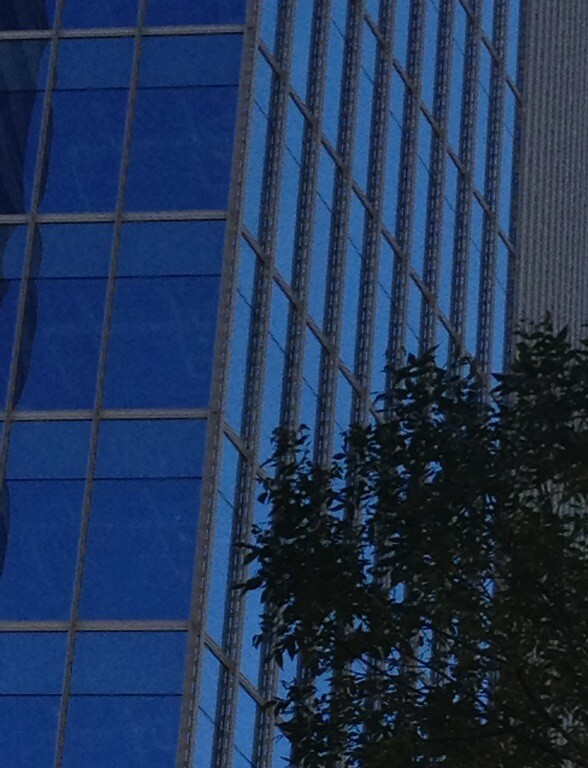 I like the way the towers reflect each other and other towers around them. The outer steel structure has a neat feature. The steel is evenly perforated with little dashes, which let through a dashed line of light. 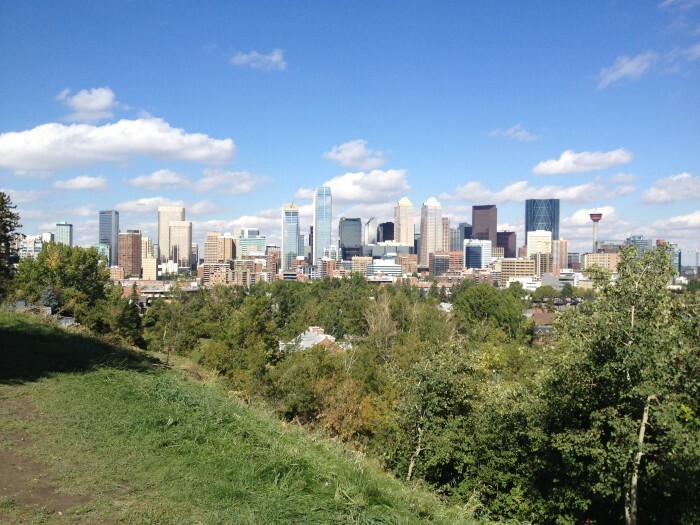 I took a picture of the downtown Calgary skyline from the south a few times. The one below I took from Upper Mount Royal; there is a bluff at the eastern end of this neighborhood. 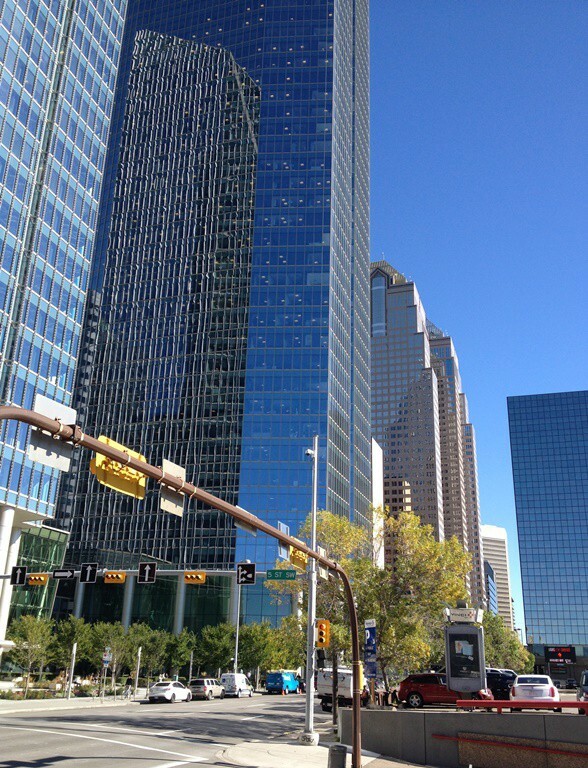 Eighth Avenue Place I (light blue, centre of image) seems to be the tallest building in this picture. However, this is likely because it is closer than The Bow (dark blue, right side) and Suncor Energy Centre (brown, left of The Bow). 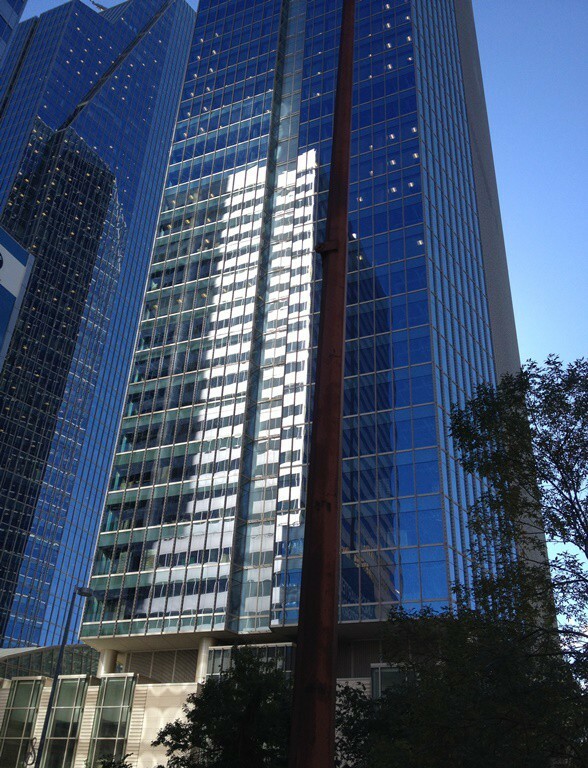 I found Calgary skyscraper information here. This one I took from River Park.